Welcome to the QOMIX group @ Nottingham! Our ﻿group﻿ is part of the Midlands Ultracold Atoms Research Centre (MUARC) in the School of Physics and Astronomy at the ﻿University of Nottingham﻿ (UK). We are interested in studying ultracold gases close to absolute zero. 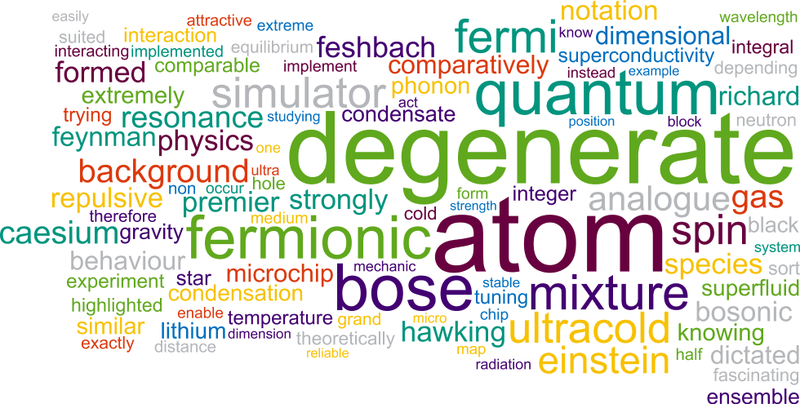 In particular we work with Bose-Fermi mixtures with fermionic Lithium 6 and bosonic Caesium 133 atoms. Our aim is to study Bose-Fermi mixtures or Bose-Bose mixtures in an optical dipole trap in one, two or three dimensions. Our mixture is also particularly interesting for the study of interactions, i.e. to create ultra-cold molecules or to investigate three and four-body bound states. We have recently created a lithium-2 Bose Einstein Condensate and are currently implementing Caesium, for which we have built a separate dipole trap. In parallel we are investigating ways to couple cold and ultra-cold atoms to photons delivered through waveguides which are chip mounted. Here we want to create a Quantum Integrated Light and Matter Interface (Quilmi), these efforts are part of a joint European project. For more details look at the Research page and check out the ﻿Publications﻿ page. July 2018: FET Open Erbesta starting!